The original version of DEVOLUTION was written back in the dark ages when people didn’t have personal computers. The novel, then called Pan-Dora Island, was written in the 1970s in a notebook with a pencil, then typed into manuscript form on a manual typewriter. The impetus was intriguing work by anthropologists studying whether o rnot chimpanzees had the ability to learn language. Chimps don’t have the physical make-up to utter words the way humans do, but could they learn a vocabulary? In the various studies that were conducted using sign language, the anthropologists discovered that, yes, indeed, chimpanzees did have the intellectual capacity to learn words, form phrases and invent new words. My thought was: what would happen if chimpanzees living in the wild rather than in zoos were taught sign language? Would they abandon the skill in time? Or would they adopt it, build on it, make it part of their rainforest culture? If the latter, what would be the longterm effects on chimpanzee society? Dissatisfied with the result, I put the idea aside for a long time and came back to it only last year. My sixteen-year-old daughter is a voracious reader who has read allm of the popular and successful young adult series from HARRY POTTER to TWILIGHT. But her favorite series of books, WARRIORS, featured wild cats as the main characters. WATERSHIP DOWN for felines. So, I switched gears and decided to write a novel that would fascinate young adults and adults alike. This time I added the precocious Chiku Flynn, the sixteen-year-old girl with the chimpanzee tatoo. 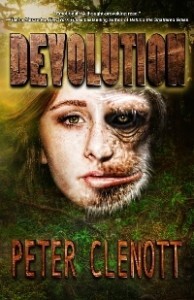 In DEVOLUTION I hope I have created an unforgettable character, a heroine who is fighting the important battle not only for the safety of her chimpanzees but for the sanctity of the rainforest and the life of our planet. 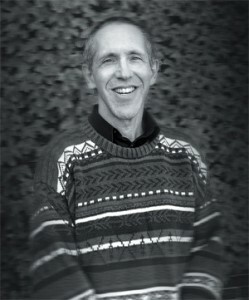 Peter Clenott is a graduate of Bowdoin College and hails from Portland, Maine. He is the author of the archaeological adventure Hunting the King and currently has three children and lives in Haverhill. August 8, 2013 in Uncategorized.